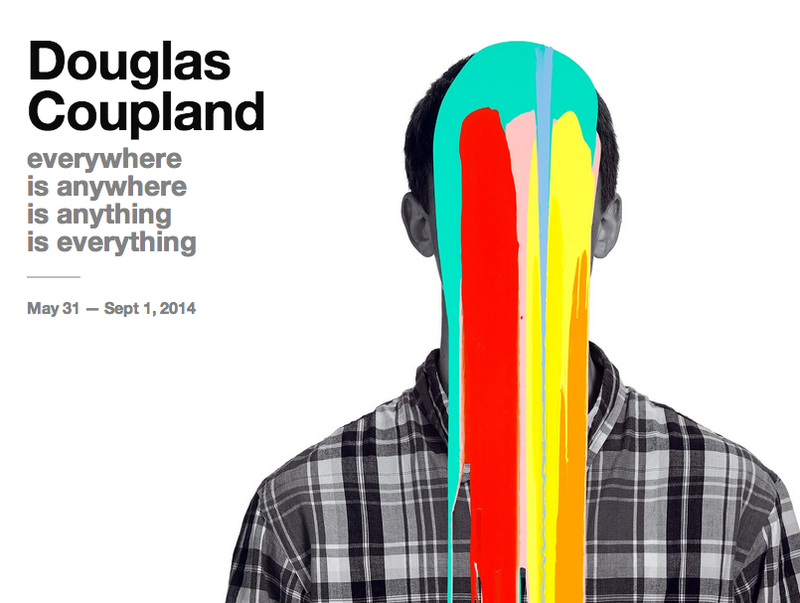 The first major visual art exhibition of artist and author Douglas Coupland opens at the Vancouver Art Gallery on May 31, 2014. Featuring over 100 works, including several new large-scale installations, Douglas Coupland: everywhere is anywhere is anything is everything surveys the past 14 years of this Vancouver-based artist’s creative output across a range of media, such as installation, painting, photography, prints, and quilts. The exhibition explores concepts of cultural identity, technology’s ubiquity and contemporary life that are central to Coupland’s work. In conjunction with the exhibition, the Vancouver Art Gallery has commissioned Coupland to create a site-specific public artwork Gumhead—a 7-foot tall interactive self-portrait by the artist, which will be on view next to the Gallery on Howe Street, starting May 31, 2014. The exhibition is accompanied by the first monograph of Coupland’s visual art, featuring essays from world-renowned authors such as Sophia Al Maria, William Gibson, James Gleick, Bjarke Ingels, Chuck Klosterman, Hans Ulrich Obrist, and Michael Stipe, co-published by the Vancouver Art Gallery and Black Dog Publishing. Spanning a diverse range of media, Coupland’s work incorporates contemporary events, popular culture, new technologies and art historical references that range from the paintings of Emily Carr and the Group of Seven to the Pop Art sensibility of Andy Warhol and Roy Lichtenstein. The title of the exhibition, everywhere is anywhere is anything is everything, reflects this range of influence, and speaks to both Coupland’s deep engagement with place and cultural identity and, simultaneously, his recognition of a growing ubiquity, as access to information becomes more readily available to the masses. “Douglas Coupland’s work sheds light on subjects as varied as the distinct nature of Canadian identity, the rise of utopian ideas, the power of words, the presence of digital technologies, the significance of the everyday, and the unshakeable nature of one’s own constitution—ideas that Coupland examines with both optimism and some trepidation.” said Daina Augaitis, Vancouver Art Gallery’s Chief Curator/Associate Director. – Secret Handshake unravels the stereotypes that constitute Canadian cultural identity, both benign and menacing. – In Growing Up Utopian, Coupland uses Lego, latent with endless creative possibilities, to reflect on both the fantastical and dystopic possibilities born out of this post-war perspective. – Words into Objects includes Coupland’s recent work Slogans for the 21st Century which contains more than 100 pithy statements about our contemporary world. – In Pop Explosion, Coupland brings classic images of the Pop Art movement into the 21st Century. – In The 21st Century Condition, Coupland references recent world events including the 9/11 terrorist attacks and introduces smartphone technology as a tool for viewers to engage with memories of that pivotal event. – The Brain focuses on a major new sculpture comprised of 5000 objects the artist has collected over the years, serving as a metaphor for the complicated ways in which the brain functions.